The TimeSlice File Exchange system is a web based application providing a secure secure method for allowing clients to upload and download files directly from a company's server. While there are plenty of cloud services available that provide file sharing, File Exchange System (FES) can be installed on a company's own public facing servers eliminating the restrictions and potential security issues related to using outside cloud services. File uploads can be directed to specific users you define in your file exchange system. Users will be notified when a file is sent to them. Virtually no limit to the size of files that can be uploaded. Users can upload multiple files through drag and drop. System administrators can define users and their permissions. Files are securely wiped upon deletion. Descriptive information can be provided with the uploaded file along with the name and address of the uploading user. Files can be "published" for download by specific external users. The external user must provide a password / pin associated with a file in order download the file. Published files have an "Expiry date" associated with the file. The file is deleted and no longer available after the expiry date. FMS is typically used to lockdown remote desktop access so that only specific computers can gain access to remote desktop on a server by restricing RDP access to a predefined set of IP addresses. Worried about remote access to your servers? Colocated and remote servers are constantly under attack from malware and hackers attempting to brute force access via remote destop in order to gain control over your server. FMS mitigates this problem by firewalling all access to specific ports (eg: RDP) except for access from specific IP addresses - your remote address(es). Restricting RDP access to specific IP addresses is problematic when the client computers are on dynamic IP addresses. That typically means just about anyone on normal internet connections. FMS overcomes this problem by providing a web interface to allow authorized users to remotely adjust the firewall rule to match their dynamic IP address. FMS will dynamically synchronize with host names defined in DNS - just update the DNS record and as soon as the new DNS zone information propogates, FMS will synchronize the port rules with the new addresses defined in DNS. Firewall Manager Service allows you to monitor multiple DNS host names. Multiple servers running FMS can monitor a shared web file and automatically update their rules within the timespan defined in the service's config file. IP addresses / DNS Hostnames that are always allowed access - defined in the FMS configuration on the server running FMS. IP address / DNS hostnames listed in a shared file accessible via a web URL. The URL is defined in the FMS configuration on the server running FMS. Changes you make to these shared addresses are automatically published to the shared file if appropriate FTP credentials are configured on the FMS service. IP address / DNS hostnames listed in a local file that is specific to the FMS service you are connected to. Changing these addresses only affects the specific FMS service. Modifiying the Shared and Local allowed addresses immediately updates the firewall on the server running FMS. Other FMS servers that are configured to use the same shared address list will sync with the shared address list changes within a few minutes. An optional web application component of FMS allows authorized users to monitor and control FMS. The web service and web application provide the ability to view and modify the allowed IP addresses on any connected server running the FMS with the web service enabled. All the above management and configuration features ensure that you can restrict RDP access to ONLY those IP addresses you want to allow. Even if the remote user is on a dynamic IP, configuration changes can be made so the remote server will allow access from the remote user while completely blocking all other access. TimeSlice has created and supported numerous applications to various regional governments in Ontario for over 20 years. Applications as wide ranging as Debenture Management Systems (DMS) and Online training systems (CLRS). We continue to provide custom application development as well as supporting the numerous applications currently deployed and in use. CCS is a desktop application used and targeted at municipal and regional government departments that need to manage insurance claim records AND to maintain certificate of insurance records related to vendors servicing the government organization. Management of vendor insurance certificates. Powerful reporting engine provides flexible reporting filtering. Reports can be exported to numerous formats: PDF, Excel, Word and more. Over 70 reports including Claims Bordereaux, Certificate renewals, Claim summaries, Legal reports. PHCM is a web based application suitable for public health call management and records systems. PHCM provides a complete record and followup system to take calls from the public, categorize the calls and subsequently track and refer the incidents to appropriate resources. PCHM integrates with the related "Booker" scheduling and appointment system for booking seminars and appointments related to calls and people related to PHCM records. TEAMS is an applicaiton used to track and management employee time across multiple departments, allocating and reporting time per department and workgroup. Payroll records are generated and managed using complex logic applying payroll rules defined by department. Employees record time worked on various projects within a payperiod using a web based timesheet. Work group managers review and adjust employee timesheets prior to submitting time to payroll. Payroll is generated and submitted to the backend PeopleSoft system. TEAMS is a web based application typically deployed on the organization's intranet. The YPROCL collions reporting system is a desktop application used by police departments. The system is used self-reported accidents as well as directly by police staff at collision reporting centres to document accidents. Track jobs in production, allocate inventory based on jobs. Suitable for electronics manufacturing companies. The Jetware Accounting system is a Microsoft Windows desktop application for small and medium sized businesses. Jetware has has a long history for solid performance and reliablity. Jetware has outlived virtually all other accounting systems. Jetware's roots were set down in the early 1980's. The product has grown and matured into its current form as a Microsoft Windows desktop application. Jetware is well suited to companies that require custom solutions to meet their unique requirements. Jetware supports all the usual accounting feautures: G/L, A/R, A/P, Payroll (Canadian), Inventory, Order entry. Customized modules can be created to provide the specialized order entry and account features many companies need, especially manufactures with complex processes. Megabasic is a high performance general purpose programming language for developing DOS and UNIX based applications. Although Megabasic is no longer actively supported by the origional author, there are still legacy systems using the programming language. Timeslice technologies provides technical assistance to developers that use Megabasic or are investigating transitioning their older DOS / Legacy applications to a Windows or web environment. 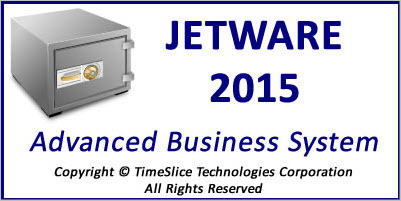 TimeSlice provides a variety of services to our business clients as well as other developers. Software development, specializing in business applications using Microsoft technologies. We provide desktop, web, and mobile application development services. Small business network installation and service. Web application / site design and hosting. Megabasic language support and software conversion.